Interview with Megan Ducket of Sew What? Inc.
Megan Ducket is owner and founder of Sew What? a custom theatrical drape maker (no, seriously, read on). Megan started out tiny, working and sewing at her kitchen table. Today she has 33 employees making backdrops for the likes of Maroon 5, Slip Knot, Green Day, Avril Lavigne, Prince, Sting, Elton John, and Madonna. Plus red velvet curtains for the cover of Rolling Stone and even stage curtains for elementary schools. 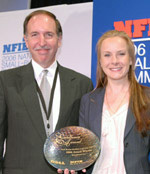 Last month, Dell and the National Federation of Independent Business (NFIB) awarded her their annual Small-Business Excellence Award. Megan has graciously agreed to share some of her entrepreneurial journey with us. Read on for insights on how to build a successful business dominating a tiny niche. 1) Megan, tell us a little about how you got started. Admittedly my interest and abilities as a seamstress came as a bit of a surprise to me. I began by accepting the challenge of some theatrical “prop” projects as night and weekend work. Although I am the craft oriented type, I never thought it was a calling of mine. I actually had taken an apprenticeship in Australia as a theatre lighting technician! So there I was, on the kitchen table, sewing unique items for special events and movie premieres. The more unique the piece, the more I was challenged by customers! I recall when the projects became too big for the table and I moved onto the floor in the garage – even spilling out onto the driveway at times. My husband and I both worked full time for a Rock and Roll staging company named All Access, so as you can imagine, adding the sewing hours by night definitely kept me busy. When tax time came in 1997, the realization that I had nearly matched my day job income with the income from my night work inspired a decision to quit my day job and rent an 800 square foot unit at the local airport. After the initial investment of the warehouse and one sewing machine, I was able to sustain a self-funding business such that the profits covered all growth and expenses. 2) You've made a name for yourself in some pretty high profile markets, to what do you attribute your continued success with this crowd? I try never to assume that any client’s business is a given. By trying to always present services and products as if each contact is our first opportunity to make a good impression, we have pushed ourselves to pursue excellence. We are creative, and passionate about what we do, and that is clear when speaking with any of us on the telephone, or reading any page on the website for that matter. I hope that Sew What? Inc will become a household name in the high profile markets for creativity, flexibility, passion and product. Our continued success will rely on providing these factors to each customer again and again. 3) The high profile customers surely bring buzz, but what portion of your business are the less glamorous customers. e.g. the schools, community theatres, trade show booths, etc? How important are they to your success as a business? We respect the business we receive from all customers – both big and small. Some of our most rewarding projects are for small churches or under-funded schools, where we are able to help them by creative manufacturing and cost saving suggestions. It is exciting to hear from the congregation or students that the stage drapes and theatre supplies we provided have had a positive effect. This type of customer currently accounts for around 50% of our business. 4) I notice one of your titles (besides President) is Marketing Manager. Can you share a bit of your marketing philosophy with us? Well let me warn you Carson – when I get to talking about marketing and branding I can go on for hours! In the beginning, marketing is not an area that interested me, so during the first four years or so, I made no efforts to market the company. I was guilty of the small business owner trap, by thinking: “I’m busy without it – why bother?” Not until I lost a large bid in 2002 due to a “lack of credibility” did I realize the importance of branding and the business credibility built by sharp marketing. Realizing that the “clip art” letterhead was not going to cut it anymore, I decided to seek assistance – not simply with a new logo and stationery – I needed to create a brand. I found (and connected with) Star Marketing by way of a referral. Owner Chris Sandberg and his talented team have become an extension of our business and a part of my day to day. Chris’ team really “got” what we were about – so much so that when I read the branding strategy they penned for us, I felt very emotional. I found myself thinking: “Finally, someone who understands me and what I am doing here!” Most small businesses are “niche” in one way of another. 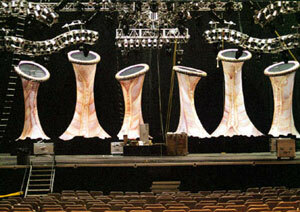 Our challenge is that we offer theatrical draperies and exhibit supplies to a broad range of customers. 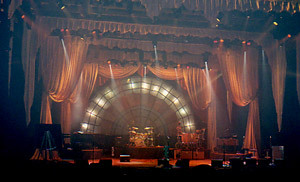 While a theatre may want to order a backdrop or stage drape, they have no interest in exhibit supplies or pipe and base. What immediately connected me to Star Marketing was their ability to understand these different markets and help me develop a plan that brings it all together – web, print advertising (coming soon), PR, and so on. The power of the web is incredible. Our website has been designed and redesigned – three times in fact. Don’t settle for second best. If you can make something better, then look for a way to achieve it sensibly. Once your site is built, the secret is to optimize it to get the full benefit of traffic. I contract with Cindy McMahan of Search Marketing Pros, who is top in her class. Cindy has helped us reach both national and global clients. My marketing philosophy is as follows: Position carefully, maintain a customer-centric focus, develop a brand that speaks for who you are (not what you think the client base wants you to be), let your passion for your product show in every piece of literature, correspondence and advertisement. Last but not least – be brave! 5) What marketing efforts have you attempted which turned out to be stinkers? So far I haven’t suffered too many blunders, but I will say that there have been some monies spent unwisely at times. I am a stickler for quantifying results, so I usually catch the problem / lack of results sooner rather than later. There were the discount coupons I distributed without an expiration date – that wasn’t cool. Also some monies wasted on printing unpolished and brandless literature – that was not very wise. I am very careful now to really assess the expenditure before signing the check. The several dozen business and marketing books in my collection help as well, and gathering opinions from others to consider when making my decisions is extremely helpful. 6) As a successful entrepreneur and businesswoman, you have many important demands on your time, yet you still manage to accomplish much. What's your secret to time management? Time management can be a struggle. I am extremely regimented when it comes to completing tasks in a timely manner – I don’t allow projects to linger. I try to keep some sort of schedule at work in terms of time committed to certain tasks. For example email correspondence in the morning, sales calls and customer service throughout the day, marketing tasks for at least 1.5 hours in the afternoon. I stay late if necessary or log into the system from home to finish up work after putting our 3 year old son to bed. One of the greatest lessons for time management I learned (at a women’s business convention) is to get help in the home. Since hiring a college student to assist with household tasks three mornings a week, I am now able to focus home time on family rather than chores. This has been life changing. I believe there are benefits to surrounding yourself with the types of people you admire and those you want to learn from. I find myself greatly inspired by people. I attribute the success of the business in part to the mentorship of other business owners whom I greatly admire and respect. I am also inspired by those characters that I may not have met, such as Michael Dell for example. His is a story that is truly inspirational. I learned much from the story of his business, which is shared in his book. It will be a tremendous honor to actually meet him in September as a result of winning the NFIB/Dell Small Business Excellence Award for 2006. I would encourage other small business entrepreneurs to participate in this award program that is so generously sponsored by Dell and the National Federation Of Independent Business. 8) Any parting advice for other aspiring entrepreneurs hoping to take their niche by storm the way you have? I am a firm believer that many types of business can be grown incrementally. (Granted – not all, and so I speak only from my personal experience) Take your vision and break it into the smallest and lowest common denominators. With your final goal in mind, you can choose wisely where to start and how to spend you money. Surround yourself with those whom you admire, always do your own research, and only risk what you are willing to lose. True passion will soon bubble to the surface and you will be able to build a strong and successful business from the ground up. Just remember there will be bumps in the road and doors that close, so be prepared with a thick skin and a determination to get up and try again. Persistence, self-education (learning from your mistakes) and determination are keys to success. Thanks Megan for sharing your ideas and inspiration. We wish you continued success.